We are happy to present an exceptional contribution to our Case of the Month section contributed by Patrick Ward. I have been fortunate to know Patrick for more than year now, and I can stated without any doubt that his knowledge and expertise in somatic rehabilitation exceeds the professional skills of many MDs or DCs I know, and his patients are fortunate to have him as a therapist. His article is an excellent illustration of what medical massage is all about. It allows the reader insight into the practitioner’s thinking process, which helps solve the most complicated clinical cases the practitioner may encounter. Patrick’s deep knowledge and excellent expertise in a significant degree is result of intense self-education and a constant thirst for professional knowledge. 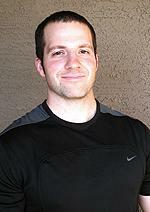 His professional accomplishments are a great example of the level massage science may elevate the practitioner. I also highly recommend the readers follow his blog. Knee pain is a common complaint among individuals who lead a physically active lifestyle (Powers, 2003). In sports and athletics, this number may increase given the high volume of training and practice as well as the intense nature of competition. Fifty percent of all injuries in the sport of American football occur in the lower extremity with 36% of those injuries being at the knee (Chaitow, DeLany, 2002). Given the high incidence of knee injuries seen in American football athletes, a potential role for the sports massage therapist may reside in ensuring that the tissue quality of the lower extremity is healthy to help decrease local stress to the joints and prevent overtraining of the musculature. The following case study details the three treatment sessions of a college football player suffering from years of anterior knee pain. The treatment consisted of both hands-on soft tissue therapy and specific exercises to help improve the athlete’s state of readiness to compete at the highest level. In an effort to provide information regarding the role of the massage therapist the exercise portion of the treatment will only be mentioned briefly but will not be detailed in this case report. The subject is a twenty-year-old college football player going into his senior season and hoping to prepare to play in the National Football League. The subject was seen in August 2011 two weeks before the start of the college football season and had a chief complaint of right anterior knee pain. The subject indicated that the pain was felt below the kneecap and was most painful during push off during running and, at times, even during walking. The subject explained that the pain has been a 9 to 10 level at its worst and a 3 to 10 level at its best and that he feels pain daily. While the problem has grown worse over the past six months, the subject has had knee pain dating back to his years in high-school football. The subject commented that he has never gone through a football season since being a junior in high school without some form of knee pain, and his current situation is keeping him from running and practicing. The subject hopes to play in the first game of the season in two weeks but currently has pain with daily activities. He is frustrated with his current situation and the possibility of not being able to compete. Multi-Segmental Extension Test – restricted and produced pain in the lumbar spine. * Test description: The client is asked to stand with his feet together and toes pointed straight ahead. The client raises his arms overhead, and backbends his body, allowing the hips to move forward and the arms to move backward, as far as they comfortably can. Overhead Squat Test – the subject reported pain in the right anterior knee as he squatted down. Single Leg Balance Test – During right hip flexion (left leg stance), it was noted that the subject performed hip flexion by hiking the hip, indicating possible over-activity of the quadratus lumborum (QL). The subject stopped the test after 5 seconds due to a cramp in his tensor fascia latae (TFL) indicating potential weakness of his psoas major and over-activity of the TFL. * Test description – The client begins by standing with his feet together and toes pointed straight ad. The client is asked to lift one leg so that the hip and knee are both flexed at 90 degrees. The client is asked to hold this position for 10 seconds while the therapist notes any pain, cramping, changes in posture or loss of balance. Side Lying Hip Abduction Test – Weakness in the gluteus medius and over-activity of the TFL (hip moving into flexion during leg lifting) and QL (hip hiking during hip abduction) were noted on the right leg. Breathing assessment revealed an upper-respiratory breathing pattern. Ankle Dorsiflexion Test – Restricted right ankle dorsiflexion in the closed chain unable to attain a position of 4″ of the knee being able to track over the toes. * Test description: The client assumes a half-kneeling position with one knee out in front of the other. The client is asked to lean forward toward the front ankle and move as far as he comfortably can without allowing the front heel to come off the floor. The therapist assesses whether or not the client can obtain a position where his knee is approximately four inches in front of the toes. Thomas Test – The test was positive revealing increased tone in the iliopsoas, rectus femoris and TFL. Ober’s Test – The test was positive revealing increased tone in the TFL. 1. Pain with palpation of the patellar ligament, just below the kneecap. 2. Trigger points in the vastus lateralis and rectus femoris mimicked the subject’s chief complaint upon palpation. 3. There was increased tone/tension noted in the right tensor fasciae latae muscle, which referred trigger points down the leg. 4. Tenderness and tone noted in the right iliopsoas. 5. Subject displayed a high amount of tone in the thoracolumbar erectors and right quadratus lumborum (QL) muscle with trigger points in the right QL that referred down towards the lateral hip. This subject presents a variety of movement faults and limitations, which may be causing biomechanical overload to the area of the right knee. Upon initial assessment, the Multi-Segmental Extension Test looks at the overall extension capacity of the body, not only spine extension, but also a global assessment of ankle dorsiflexion, hip extension, and shoulder flexion (reaching the arms overhead and backwards). The limitations can be seen in other, more demanding, movement patterns where similar movement competencies are required. For example, in Single Leg Balance Test there is a need for steady extension in the leg that the subject is standing on as the opposite hip and knee are flexed, i.e., the position which reflects ambulation. Failure to attain an asymmetrical pattern in the hips biomechanics would limit the subject’s movement when running. The cramp that the subject displayed in the right TFL and the hiking of the hip while flexing the right hip during Left Single Leg Balance Test could indicate potential over-activity of the TFL and QL since these muscles are working harder to lift the leg and hold it there to assist the psoas muscle, which is not strong enough to complete the task. Finally, in the Overhead Squat Assessment Test without healthy extension in the upper extremity, the subject will fail to keep the arms and torso upright and, if dorsiflexion in the ankle joint is limited, the subject’s depth of squat and/or posture during test application will be negatively impacted. The findings from the Muscle and Joint Assessment Tests allowed further determination of the key links that may be hindering proper movement. The Ankle Dorsiflexion Test showed limited dorsiflexion in the right ankle joint. This test shows how the talocrural joint works in the upright posture and during walking. A decrease in ankle dorsiflexion may cause changes in normal gait as the subject is forced to rotate the foot outwards, increasing pronation and causing a greater demand on the hip flexors and QL to lift the leg during the swing phase of gait to allow the foot to clear the floor (DeLany and Chaitow, 2002). This may create a limitation in hip extension as the subject seeks an altered strategy to perform the task of walking or running (DeLany and Chaitow, 2002). A limitation of right hip extension was confirmed with the Thomas Test indicating tightness of the three main hip flexor muscles-liopsoas, TFL, and rectus femoris-and the increased tone in the TFL was further confirmed with the Ober’s Test. The increased stiffness of these muscles may potentially be a contributing factor to the poor extension pattern. Additionally, the musculature of the hip is important to note in those complaining of knee pain due to the hips’ influence over lower extremity movement (Powers, 2003). While it was once thought that abnormal tracking of the patella was the cause of knee pain, research has since indicated that the patella tracking is not as much of a problem as the movement of the femur and tibia in the frontal and transverse planes during dynamic movements such as running (Powers, 2003). Thus, addressing the function and strength of the hip musculature should be a key consideration in comprehensive treatment of the athlete suffering from anterior knee pain. Similarly, there was a sensitive area in the rectus femoris, referred to as a center of coordination (Stecco and Stecco, 2009), which resides halfway between the patellar and inguinal ligament lateral to the rectus femoris, where it makes contact with the vastus lateralis. This spot has been noted to refer anterior knee pain when the fascial structures in that region become too bound together. A final piece of the puzzle might be found in the altered breathing pattern the subject displays. Breathing, under control of the autonomic nervous system, may change in response to the pain the subject feels and the anxiety that he is currently unable to practice or compete in his sport (Moore et al., 2011). It is possible that the psoas and QL, which share a fascial connection with the diaphragm, may be working harder and their tension increased. Both muscles will additionally stabilize the lumbar spine to assist the diaphragm to move downward during the upper respiratory pattern the subject is displaying (DeLany and Chaitow, 2002). Finally, breathing in the “extension” position will contribute to slight upward rotation of the ribs and this can be a contributing factor to the increased tone of the lumbar erectors noted during the palpatory assessment. With the information gained from the three-part assessment, I formed a treatment approach that began by first treating the soft tissue of the lumbar spine and right QL, progressing to the right TFL and right iliopsoas, and finally the right quadriceps. The femoral nerve innervates the quadriceps musculature and is a branch of the lumbar plexus. Therefore, treating the lumbar spine and the attachments of the QL at the lumbar vertebrae may have a positive influence on the lumbar plexus, which also has direct branches that innervate the iliopsoas muscle (Turchaninov, 2006). Trigger points seen in the vastus lateralis may be due to a reflex response from increased tone placed upon the lumbar plexus and the L4 dermatome runs directly over the anterior knee (Turchaninov, 2006). The QL trigger points were also treated first because satellite trigger points may form along distribution of referral pain. In the case of an active trigger points in QL muscle, the pain may refer to the lateral hip contributing to tension and active trigger points in the right TFL. Involvement of TFL will affect the function and tension in the Iliotibial Band, which lies over the vastus lateralis and contributes to its tension (Travell and Simons, 1988; DeLany and Chaitow, 2002; Turchaninov, 2006). Finally, the rectus femoris and vastus lateralis were treated because of their trigger points and the center of coordination, which refers to the anterior knee and, when provoked, mimicked the subject’s chief complaint (Travell and Simons, 1988; DeLany and Chaitow, 2004; Turchaninov, 2006; Stecco and Stecco, 2009). The subject was seen for three sessions over three consecutive days due to time constraints. Each session began with approximately 15 to 20 minutes of soft-tissue therapy to the involved structures and concluded with 40 minutes of exercise that targeted the athlete’s movement inadequacies. The first session consisted of general relaxation to the lumbar erectors and trigger-point therapy on the right QL. This was followed by trigger-point therapy on the right TFL until trigger-point referral was decreased, and the subject reported that the tissue was pain free to the touch. Upon completion of the treatment to the lumbar spine, right QL, and right TFL, the iliopsoas was re-palpated and there was a noticeable decrease in tenderness and an improvement in overall tissue tension and tone at this site. The right iliopsoas muscle was treated with gentle compression and post-isometric relaxation stretching. Finally, a decrease in tension was noted in the right quadriceps muscle following treatment of the above structures and there were only a few spots of tenderness and trigger points noted in the rectus femoris and vastus lateralis, which were treated with trigger-point therapy followed by gliding strokes and post isometric relaxation stretching. The treatment session was approximately 20 minutes. Following treatment, the subject was taught activities that emphasized mobility of his ankle and hip as well as exercises to help him retrain the strength of his hip extensor musculature. Following the first treatment, the subject reported feeling an 80% reduction in pain and only slight pain during squatting. The subject commented that he woke up for the first time without knee pain in a long time. A similar treatment session was performed as noted above and the subject was given further exercises to help strengthen the appropriate areas to assist him to get back on the road to playing and competing. During the third and final session, the subject reported being pain free and had no pain with squatting. A similar massage treatment was performed as noted above; however, the treatment session was brief because the subject displayed a decrease in tissue tension, tenderness, and trigger points in the involved areas. The treatment was again followed with more exercises this time progressing to more advanced strength exercises. The subject resumed light practice the following day, continued to practice up until the start of the season when he was able to compete and start in the first game of the college season. He played the first five games of the season free of knee pain until he ruptured his biceps tendon making a tackle. Cook G, Burton L, Kiesel K, Rose G, Bryant M. “Movement: Functional Movement System – Screening, Assessment, and Corrective Strategies.” On Target Publications, Santa Cruz, CA. 2010. DeLany Chaitow L, J. Clinical Application of Neuromuscular Techniques Vol 2: The Lower Body. Churchill Livingstone. 2002. Patrick Ward holds a Master’s Degree in Exercise Science, is a Certified Strength and Conditioning Specialist through the National Strength and Conditioning Association and is a Licensed Massage Therapist.